He had a 10-year career in the National Football League, during which time he was a linebacker for the Oakland Raiders and Cleveland Browns. Following his retirement, he tackled business and motivational speaking. On March 18, Gerald Irons will veer toward Sam Houston State University, where he will discuss his life, career and his focus on education for the spring President’s Speaker Series presentation. The discussion will begin at 11 a.m. in the Gaertner Performing Arts Center Payne Concert Hall. Iron’s six-year career with the Raiders and four years with the Browns heralded a plethora of awards and recognitions, including several Golden Helmet Awards, being named team captain by the Raiders and an “Oakland Raiders Legend,” as well as a spot on the “100 Greatest Cleveland Browns” of all time list. During this time, he also hosted the “PM Magazine Show” on TV and the “Gerald Irons Sports Report” on radio. But despite this renowned career, Irons has always recognized the importance of education, a lesson instilled as a child by his parents. A graduate of the University of Maryland—Eastern Shore with a Bachelor of Science degree in business administration, Irons worked during every off season with the Raiders attending The University of Chicago’s graduate school of business and earned his Master of Business Administration degree. He also had an affinity for service, becoming the national television spokesman for the United Way. He was invited to the White House by President Jimmy Carter to discuss solutions to youth unemployment in America and served as a liaison for U.S. Sen. John Glenn’s successful re-election. 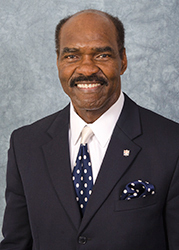 More than 30 years ago, following his retirement from the NFL, Irons and his family relocated to The Woodlands, where he began working as the vice president for business development for The Woodlands Development Company and eventually got involved with the Conroe Independent School Board. At the end of his 22-year tenure with the CISD School Board, Conroe ISD named a new junior high in his honor. The “Gerald D. Irons Sr. Junior High School” opened in August 2012 and serves seventh and eighth graders. In addition to his football accolades, Irons has been recognized with the Gary, Indiana, “Outstanding Garyite Award” from Mayor Richard Hatcher and a day was named in his honor. One of the Osaka, Japan, Junior Chamber of Commerce’s “Ten Outstanding People In The World,” Irons—who speaks Japanese—spent a month in Japan representing the U.S.A at the “Ten Outstanding Young Persons Conference.” While in Japan, he met with the emperor, prime minister, crown prince, and crown princess and was presented with a “Gold Key” to the City of Osaka by its mayor. At home, Irons has been noted for presiding over a one-man fraternity. He and wife Myrna—his high school sweetheart, to whom he has been married for 44 years—have three sons who all played football at Division I universities on full scholarships. Gerald Jr. graduated from the University of Nebraska, Jarrett graduated from the University of Michigan, and Grant graduated from the University of Notre Dame.